Forget PIK - this is PIG. Regular readers of Zero Hedge are probably familiar with money-for-oil loans. But one liquidity-challenged pork producer is pushing an absurd twist on that concept that has helped to expose the financial dysfunction at many small- and medium-sized Chinese companies. Instead of receiving cash, holders of local-currency bonds issued by Zhengzhou-based pork producer Chuying Agro-Pastoral Group Co will be paid with the company's ham, thanks to an agreement reached between the company and its creditors. Assuming the agreement, which was revealed in a security filing on the Shenzen Stock Exchange, holds, the "in kind" payments will only apply to the interest on the bonds, according to the South China Morning Post. The agreement was struck after the company failed to repay a 500 million yuan bond that was due on Nov 5. The spread of African swine fever has caused pork demand in China to plummet, creating a cash-on-hand crisis for pork producers. As of Sept 30, the company had 1.3 billion yuan in cash against a short-term debt load of 8.4 billion yuan, according to data from Bloomberg. 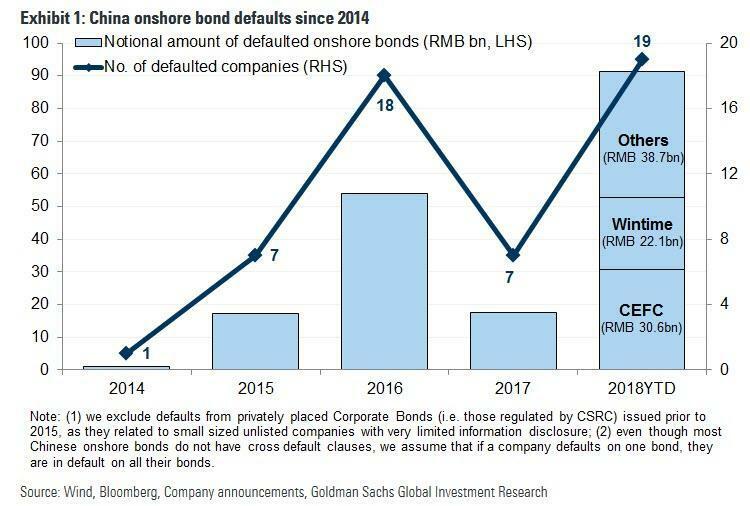 This latest near-miss happened amid a record wave of onshore bond defaults by Chinese companies. These defaults have shaken the faith of the country's bondholders, created anxieties among international investors, who have only recently gained entree to the Chinese bond market, and forced the PBOC to reverse some of its tight-money policies aimed at facilitating a deleveraging in China's heavily indebted corporate sector. As one fixed-income analyst who spoke with the SCMP pointed out, so-called "payment in kind" typically isn't acceptable to bond holders. And while the payment in ham only added to concerns surrounding the solvency of small and medium-sized Chinese businesses, investors shouldn't worry. Because the Communist Party is coming to rescue them. "Payment in kind is generally not seen as acceptable for debt repayment," said Judy Kwok-Cheung, director of fixed income research at Bank of Singapore. This implies increasing liquidity concerns for for small and medium-sized enterprises in China, she said. "Liquidity injection from the government directed at helping SMEs has eased concerns somewhat, but the market potentially needs more," according to Kwok-Cheung. To put these payments in context, one gift package of Chuying Agro-Pastoral's ham costs 8,999 yuan (S$1,780) on JD.com, one of China's most popular e-commerce websites.